Please call 281-455-6372 or email Events@HopperMoonwalks.com to inquire about this item which is currently blocked from online ordering. Helpful information to include would be your party date & times, address or zip code, phone number, and set-up surface (grass or concrete). --- Additional info about blocked items: This may be a brand new unit with an unclear arrival date, an item currently in repair, or perhaps an off-season unit. An example of an off-season item would be a dry slide during the summer months. We only rent these indoors or in covered / highly shaded areas, as the slide's exposed vinyl in direct sun would get too hot for anyone to enjoy. *NEW* ~ Hopper Moonwalks is now offering glitter tattoos! 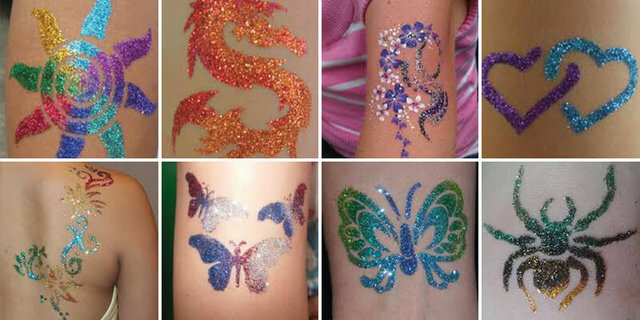 Add loads of fun to any event with one of our glitter tattoo artists and hundreds of tattoo options to choose from.